I love this card! 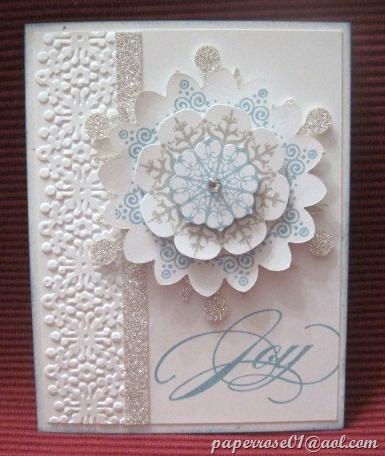 The Snowflake Soiree idea was case’d from a card created by Dawn Olchefeske. The Floral Flames Framelits are used to die cut the snowflakes. We will use a trick or two to insure the delicate snowflakes do not look like flowers. We also will use the new Bigz Snow Flurry die to create our sparkly silver snowflake base. 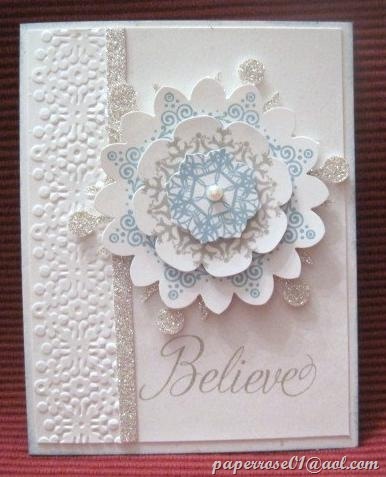 Stampin’ Dimensionals separate each snowflake layer giving a beautiful 3-D effect. A thin strip of Silver Glimmer cs and the snowflake Delicate Designs embossing folder set off the Baja Breeze, Sahara Sand and Whisper White snowflake. Tucking a bit of Silver Glimmer cs inside the card carries the sparkle through to the message. 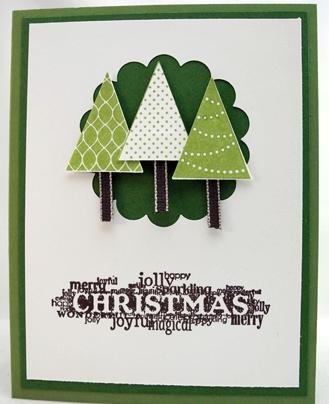 This is just one of the beautiful holiday cards we will be creating at our Christmas Stamp Camp on December 7th (3 PM – 9 PM) and December 8th (8 AM – 4PM). Note we will be ready to stamp at 3 PM on Friday and 8 AM on Saturday as I know everyone is busy and can’t spend all day stamping! Give me a call (630-759-3089) or drop an E-mail to paperrose01@aol.com if you have any questions. Stampin’ Up! Punches 30% Off! Dawn’s Pennant Parade Holiday Tree Card features both the Pennant Parade Stamp Stamp Set which is on sale for 40% off and the Petite Pennants Punch which is currently on sale for $11.87 (30% off. The Blossoms Petals Punch is also on sale at $11.87. 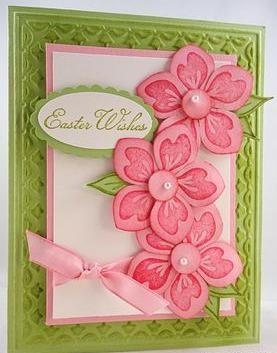 Dawn created this eye-catching Easter card which features the blossoms punch. 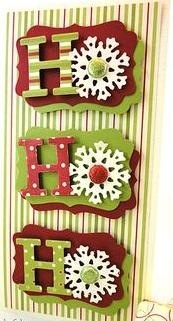 Finally, check out Dawn’s Ho Ho Ho card using the Decorative Label Punch – also 30% off at $11.87. The 1” Square Punch and the Scallop Edge Punch are on sale for $11.17. This Online Extravaganza on Wednesday, December 28th. You can place your order on line, or give me a call at 759-3089 or drop an E-mail to paperrose01@aol.com and I will place the order for you. Don’t forget about the Christmas Stamp Camp on December 7th and 8th! World Treasures is a card I had planned for the September Stamp Camp – before I fell and broke my ankles. We will be doing this card in 2013 and I wanted to share it now as it is such a striking stamp – page 98 in the Stampin’ Up Catalog. I also like the message that comes with this stamp – One who finds a faithful friend finds a treasure. I used a color scheme of Raspberry Ripple and Midnight Muse, International Bazaar DSP, and the Fancy Fan embossing folder. Rhinestones add a touch of bling to the peacock feathers. If you are looking for a holiday gift for a stamper, I would recommend this set as it has so many possibilities. It is priced at $17.95 in clear and $23.95 in wood. I will honor the 10% discount for this set that I had on my coupon sheet for September. Our December Stamp Camp will be held December 7th – 3 PM to 9 PM, and December 8th – 9 AM to 4 PM. We will be doing 4 holiday cards – a beautiful snowflake card using the new Snowflake Soiree set and the Snow Flurry Bigz Die, an elegant ornament card featuring the new Ornament Keepsakes stamp set and framelits dies, a cutesy card with the new Scentsational Season stamp set and the matching framelits dies, and finally a Christmas tree card done with the elegant Evergreen stamp set using the Illuminate Glimmer Watermark Stampin’ Pad and Champagne Glimmer Paper. We are limiting to 4 cards as we know everyone is busy and would like to stick to a 2-hour stamp camp. 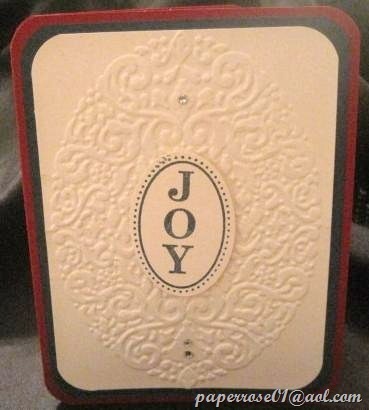 Christmas Joy is an elegant card created with the new Holiday Frame Embossing Folder and the Joyous Celebrations stamp set. 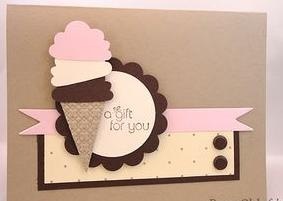 Cherry Cobbler and Midnight Muse cs frame this simple card front. 3 rhinestones and a misting of home brew add sparkle to the finished card. “Joy” can be stamped in Midnight Muse or Cherry Cobbler. 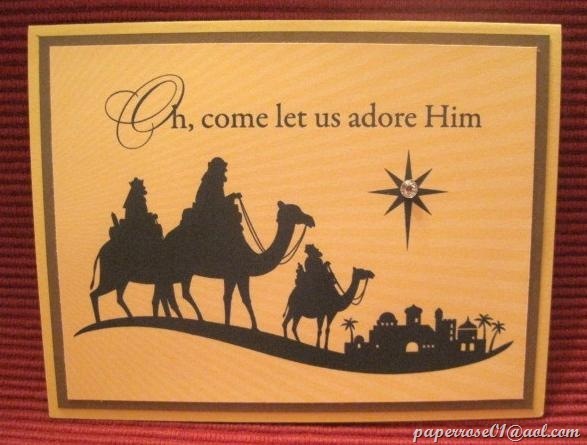 This is the final card we will be making at the November 9th and 10th Stamp Camp – 4 cards for $10.00. I hope you can make it. Give me a call or drop me an E-mail with any questions you may have. Looking forward to seeing you! Our punched Thanksgiving Owl is sending a happy message as he perches on a fall leaf and Old Olive stem. I designed this card in the fall colors of Cajun Craze, Always Artichoke, Very Vanilla, and a touch of Early Espresso. The wood-grained DSP adds a nice touch to the background. The fall leaf is created from a die-cut More Mustard maple leaf that was folded in half, and run through the new wood-grained embossing folder to add the veins in the leaf. Cajun Craze, Red Riding Hood, and tangerine inks were sponged on the leaf and misted with water. The water blends the colors together for the fall effect. 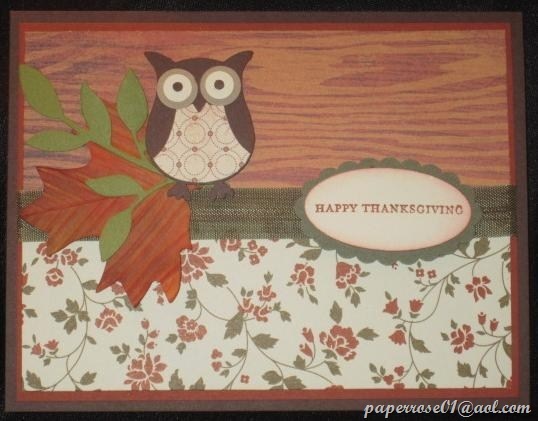 Thanksgiving Owl is one of the four cards we will be creating at the November Stamp Camp. The date is November 9th from 4 PM to 9 PM, and November 10th from 9 AM to 4 PM. $10 is the cost for all the materials. All you need to bring is yourself! As a reminder, the Christmas Stamp Camp will be held December 7th and 8th. This will feature 4 holiday cards – a beautiful snowflake, a Christmas tree, a cute line-up of holiday items, and a simple ornament card. Mark you calendar now. When I think of fall flowers, the chrysanthemum always comes to mind. The Blooming with Kindness stamp set features this beautiful chrysanthemum and several nice sayings. 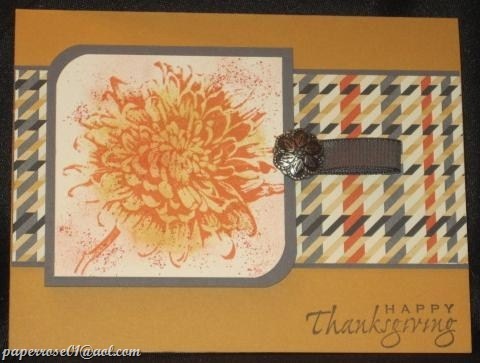 I used a color scheme of More Mustard, Basic Gray, and Tangerine Tango for this Thanksgiving card. The mum is stamped in tangerine , sponged in So Saffron, and spattered in tangerine. The Howlstooth and Scaringbone Designer Series Paper carries through the color scheme while adding an interesting visual pattern. The card is finished with a bit of Basic Gray taffeta ribbon and an antique brad. 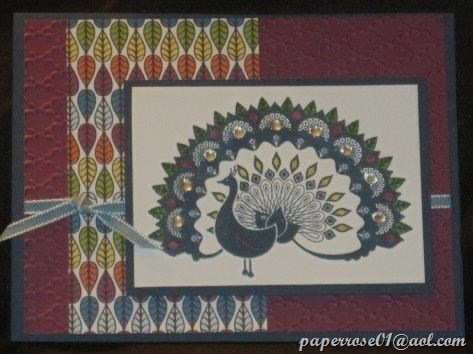 Although this card has a Happy Thanksgiving message, it could easily be used for any fall occasion. Hope you can come and make this card during the November Stamp Camp on Friday, November 9th from 4 PM – 9 PM or Saturday, November 10th from 9 AM – 4 PM. We will be creating 4 cards and the cost will be $10.00. I have missed everyone during my knee/ankle rehab time and would LOVE to see you all!